Homeless in New York City. As record-breaking cold weather sweeps across the nation this week, reports from around the nation show how the U.S. homeless population—which has risen dramatically in recent years—are being hit the hardest in the wake of slashed funding that has left shelters overburdened and public services at their breaking point. “It’s a death sentence, you can’t survive, you get hypothermia, you go to sleep and you die,” said Louann Harbert, a homeless resident. Friends of the Homeless volunteers were searching throughout the night for those in need, helping them to find a warm place to sleep. While many people can crank up the heat during winter months – the homeless population don’t have that option. Hundreds are stuck outside, sleeping in makeshift tents with no source of heat. With overnight low temperatures dropping into the teens, winter emergency shelters are filling up quickly. On most nights, hundreds of men, women, and children are staying at places like the Greensboro Urban Ministry. Across the Jersey Shore, frigid temperatures and nasty winds sent the homeless into shelters and public spaces looking for a warm place to stay, people who normally would spend the night in their cars or in public spaces outdoors. [Wednesday] was the second night this year that the city had announced a “cold emergency,” which allows officials to order homeless people into shelters when the temperature hits 15 degrees or below without snow, and 20 degrees when it’s snowing. The warming centers held 295 adults — 41 percent more than at this point last year. The numbers illustrated the mounting challenge facing the city as it attempts to fill its moral and legal obligation to house a burgeoning homeless population. At the Pine Street Inn, where demand for beds has reached record levels, more than 100 people have been sleeping on the floor of the lobby on recent nights. Officials are now planning to open their dining room to provide additional space. Pine Street is running its outreach vans day and night and will allow the homeless to remain in the shelter throughout the cold spell. “Everyone’s concerned about what will happen this week,” said Barbara Trevisan, a spokeswoman for the Pine Street Inn. Dr. James O’Connell, president of Boston Health Care for the Homeless Program, said he has seen about 30 percent more people on the streets this winter than last year. Children, including babies, are part of a wave of homeless Chicagoans who’ve swelled the population of the city’s largest 24-hour shelter past capacity during this week’s extreme cold spell. On Wednesday evening, 1,075 people — including 30 children — slept at the Pacific Garden Mission in Pilsen. “We have 990 beds but we don’t turn anyone away,” said Pastor Phil Kwiatkowski, President of the Mission at 1458 S. Canal. Jeff, who asked that his last name not be published, lived in a space outside of the Tops plaza in North Buffalo. During Buffalo’s blizzard last March, he was taken by ambulance to the hospital when he could no longer walk. In November he was back on the street. The severe storm that month claimed his other leg. Someone found him unconscious. “You don’t realize what you lose until you lose it. There’s so many things I can’t do. I’m restricted to the bed or the chair,” Jeff lamented. 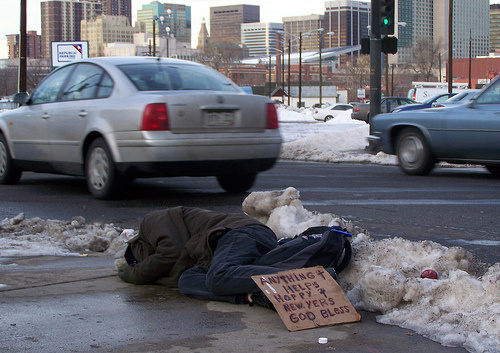 Though every winter season brings difficult times for those without permanent housing, a report released in December by the U.S. Conference of Mayors showed that homelessness rates grew across the country in 2014, a trend driven by lack of affordable housing, widespread unemployment, chronic poverty, and a lack of needed services for those struggling with mental illness or substance abuse. Meanwhile, a report released in Novemeber by the National Center on Family Homelessness showed there are now more homeless children in the U.S. than anytime in the nation’s history. It’s a solution that might sound too simple, but it’s working. The program, called “Housing First,” has origins in New York. Utah started its own pilot of the program in 2005 with 17 people. The state took them off the street and put them into housing for 22 months. After the state saw all 17 people remained housed and stable during that time, the project was expanded. To date, the rate of chronic homelessness in Utah has dropped 72 percent since the program’s inception. This entry was posted in Austerity, Economics, Government, Homeless, Human Rights, Human Spirit, Income Inequality, Social Justice, Solidarity, Veterans and tagged Capitalism, Economics, Homelessness, Income Inequality, Solidarity, Veterans on January 13, 2015 by ew.